Here are cheap deals for the Hugo Vapor Asura. This device is a 2-in-1 temperature and squonk mod. It features a detachable squonk system, dual 18650 compatibility, versatile temperature control, low 0.06ohm resistance capability, a GT228 chipset and fast 2 amp charging. Design-wise, the portable mod measures 88mm x 46mm x 50mm, but you may detach the squonk system in which case the size comes in at 88mm x 46mm x 35mm. The Asura is made from die cast zinc alloy and has available colors of yellow, purple, red, black and blue. 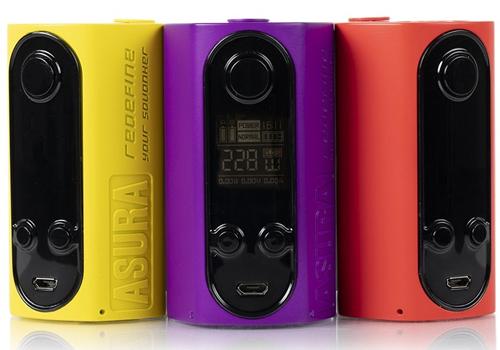 On the sides, there is a protruding Asura logo and protruding text that reads “redefine your squonker”. On the control face, you will see a fire button, two adjustment buttons, a micro USB charging port and a display screen with vertical vape data that includes all the standard indicators such as battery bars, current wattage, mode, puffs, resistance, voltage and more. On top, there’s a center 510 connection bezel that is hollow for use with a BF atomizer and won’t have any overhang with atomizers that measure 26mm or less in diameter. In the operation department, the Hugo Vapor Asura Mod is built with a GT228 chipset. As a result, it is capable of firing with 228 watts of power and can operate in power mode, temperature control with stainless steel mode, temperature control with nickel mode, temperature control with titanium mode, TCR mode and clock mode. The minimum atomizer resistance is a rock bottom 0.06ohm, ensuring the Hugo Vapor Asura is highly compatible with most builds or tanks. And, the device utilizes dual 18650 cells which are recharged lightning fast via a 2 amp quick charge micro USB port. This interface is also used for future firmware upgrades.